A written notice of termination of the home education program shall be filed in the superintendent’s office within 30 days of said termination. Statute 1002.41(1)(a). You move to another county, state or country. If you move within the state, you must terminate your program in the county you moved from and initiate a new program in the county you move to. You decide to enroll your child in public or private school, implement a private tutoring program or otherwise stop home educating under the home education statutes. You may also terminate your homeschool program when your child reaches age 16 and is no longer subject to compulsory education laws, however, there are several factors to take into consideration before you decide to do this. 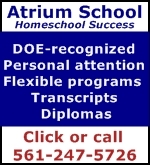 One is that if you wish to take advantage of dual enrollment options, you will need to establish that your child is registered in a home education program or private or public school. Another is that some health insurers allow minor children to be covered only so long as they are full-time students. Be sure to assess your personal situation before terminating your program. Your Notice of Termination, like your other notices, should be brief, include the student identification information specified previously, and be signed by a parent or guardian. Your Notice of Termination does NOT need to include information about why you are terminating your program nor if or where your child(ren) will be attending school next. A sample Notice of Termination can be found in the Forms and Samples section of this site.